Immunogenic peptides of human tumor Ag have been used to generate antigen-specific CTL. However, the vast majority of these peptide-specific CTL clones are of low avidity and are peptide, but not tumor, reactive. Peptide-MHC tetramers have been shown to bind specific TCRs with sufficient affinity to be useful reagents for flow cytometry. In this paper we demonstrate that peptide-MHC tetramers can also be used to selectively identify high avidity tumor-reactive CTL and enrich, from a heterogeneous population, the subpopulation of peptide-reactive T cells that can lyse tumor targets. 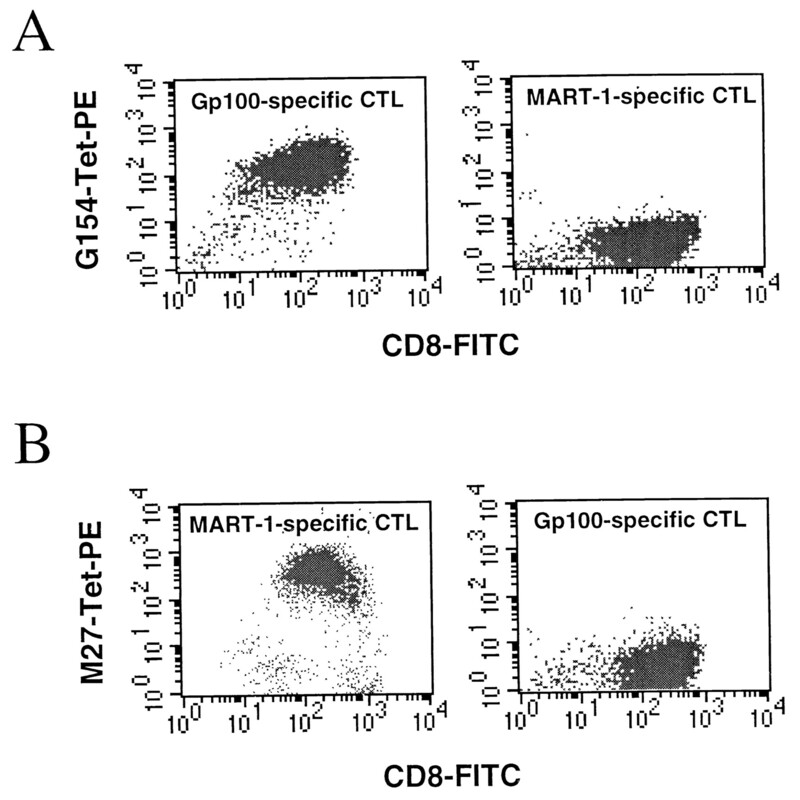 The melanoma proteins, MART-1 and gp100, were used to induce potentially tumor-reactive T cells, and the intensity of T cell staining by TCR binding of specific peptide-MHC tetramers was assessed. A range of fluorescence intensity was detected, and the magnitude of tetramer binding was correlated with T cell avidity. The population of peptide-reactive T cells was phenotypically similar with regard to expression of TCR and adhesion molecules, suggesting that this differential avidity for tumor cells reflected differential affinity of the TCR for its peptide-MHC ligand. Sorting, cloning, and expansion of tetramerhigh CTL from a heterogeneous population of peptide-stimulated PBMCs enabled rapid selection of high avidity tumor-reactive CTL clones, which retained their functional and tetramerhigh phenotype on re-expansion. These results demonstrate that the avidity of a T cell for its tumor target is due to the specific affinity of the TCR for its peptide-MHC ligand, that this interaction can be described using peptide-MHC tetramers and used to isolate high avidity tumor-reactive CTL. The identification of tumor rejection Ags in a number of cancers has enabled the rational development of strategies for the generation of Ag-specific tumor-reactive T cells for adoptive therapy. One such strategy involves the use of peptide sequences corresponding to immunogenic epitopes of a given tumor Ag to pulse APCs expressing the relevant class I allele to stimulate and expand in vitro tumor-specific T cells for use in adoptive therapy 1, 2, 3 . Although this approach has met with variable success, the practical application of this method to the clinical setting has been impeded by two obstacles: 1) the precursor frequency of T cells recognizing these tumor Ags is very low, since most of these tumor Ags are also normal self proteins expressed in some normal tissues 4, 5 ; and 2) due to negative selection of high avidity self-reactive T cells, most of the detectable tumor Ag-specific T cells have only a low affinity for the tumor Ag and are not capable of recognizing tumor cells endogenously expressing the Ag 6, 7 Furthermore, studies have demonstrated the loss of high avidity CTL following in vitro stimulation with peptide-loaded APCs 8, 9 , making the isolation of tumor-reactive CTL from patients more difficult. As a result of such obstacles, efforts to isolate tumor-reactive T cell clones from the peripheral blood have seldom been successful despite multiple rounds of in vitro stimulation to enrich for rare Ag-specific T cells recognizing a normal self protein, followed by cloning and expansion of potentially hundreds of T cells from this bulk culture in the hope of subsequently identifying a tumor-reactive T cell clone. Such extensive tissue culture may be impractical for the development of a treatment modality, since it is extremely labor intensive and requires more time than may be available for patients with potentially progressive tumors. Therefore, a critical requirement in the expeditious generation of high avidity tumor-reactive CTL clones is the ability to rapidly identify such clones from the heterogeneous population of T cells in vitro. Recently, peptide-MHC tetramers have been developed for use as fluorescent-conjugated reagents to enumerate the population of peptide-specific T cells in the peripheral blood 10, 11 . The use of tetramers provides an advantage over currently available methods, since the assay is more rapid and permits an assessment of the total number of peptide-specific T cells in the peripheral blood without the need for in vitro manipulation. It is also more sensitive as data indicate that limiting dilution assays underestimate the number of Ag-specific CTL by 20- to 50-fold 12, 13 . Peptide-MHC tetramers have been widely used to quantitate the accumulation of virus and bacteria-specific T cells in animal infection models 14, 15, 16, 17 . While peptide-MHC tetramers have been useful in monitoring the frequencies of reactive T cells, their use in prospectively identifying and selecting high avidity CTL from a heterogeneous population remains to be explored. In contrast to viral-induced immunity, the immune response to tumor cells is often less vigorous and results in CTL of lower avidity, especially when tumor Ags are represented by normal self proteins 18, 19 . Therefore, we determined whether tetramers could be used to identify tumor-specific CTL clones from heterogeneous populations and to isolate high avidity CTL clones from T cell cultures derived from patients with melanoma for potential expansion and use in adoptive therapy. To evaluate the strategy of using peptide-MHC tetramers, T cell clones were generated against two tumor Ags expressed in 80–100% of human melanomas, MART-1 (or MelanA) and gp100 20, 21, 22 . Since these tumor Ags are nonmutated self proteins found in normal pigmented tissues, potentially autoreactive T cells recognizing MART-1 and gp100 exist only in low numbers in vivo and therefore represent ideal model Ag for evaluating this approach. Peptide sequences corresponding to HLA-A2-restricted immunogenic epitopes of these two proteins have been identified and used to generate MART-1 and gp100 peptide-specific T cells 23, 24, 25 . However, the majority of such peptide-reactive T cells are not tumor reactive 1 . Our results demonstrate that the avidity of T cells for its tumor target can be predicted by the affinity of its TCR for the peptide-MHC complex, that the affinity phenotype of a given T cell can be described using peptide-MHC tetramers, and that this phenomenon can be exploited using peptide tetramers to facilitate the rapid isolation of high avidity tumor-reactive T cell clones. The 221-A2 cell line is an HLA-A, -B, and -C null mutant human B lymphoblastoid cell line transfected with the HLA-A2.1 gene 26 (gift from Dr. D. Gerahty, Fred Hutchinson Cancer Research Center, Seattle, WA). The tumor cell lines A375 and 624 mel have been previously described 27 (gift of Y. Kawakami, Surgery Branch, National Cancer Institute, Bethesda, MD). Both lines express HLA-A2, but only 624 mel also expresses gp100. SK29.1 is a tumor cell clone that expresses HLA-A2 and Melan-A/MART-1 (gift from P. Coulie, Ludwig Institute, Brussels, Belgium) 23 . The following FITC-conjugated Abs were used: LFA-1 (Becton Dickinson, Mountain View, CA), CD28 (Becton Dickinson), and CD2 (Becton Dickinson), CD8 (Caltag, Burlingame, CA). All studies using human subjects received prior approval by the institutional review board at the Fred Hutchinson Cancer Research Center. Following informed consent, PBMC were obtained from donors by leukapheresis. The donors were typed by the HLA Typing Lab at the Puget Sound Blood Center (Seattle, WA). CTL lines from HLA-A2+ donors were generated in a manner similar to that previously described 2 . The PBMC were washed twice in sterile PBS; suspended in CTL medium consisting of RPMI, 25 mM HEPES, 2 mM l-glutamine (Life Technologies, Gaithersburg, MD), and 10% human serum; and then placed in sterile tissue culture dishes for separation into adherent and nonadherent populations by culture for 2 h at 37°C. The adherent cells were treated with huGM-CSF (Immunex, Seattle, WA) and IL-4 (Endogen, Woburn, MA) for 5–7 days. The PBMC-derived DC were then harvested and pulsed with 40 μg/ml of either the G154 peptide corresponding to an A2-restricted immunogenic sequence of gp100, KTWGQYWQV or the M27 peptide corresponding to an A2-restricted immunogenic sequence of MART-1/MelanA, AAGIGILTV (Multiple Peptide Systems, San Diego, CA) for 4 h at a cell concentration of 2 × 106/ml in PBS with 1% human serum albumin (Life Technologies). The DC were irradiated and plated into 48-well plates at 2.5 × 104 cells/well. PBL as a source of responder T cells were depleted of CD4+ T cells using immunomagnetic beads (Dynabeads, Dynal, Oslo, Norway) and added at a responder to stimulator ratio of 20:1. IL-7 (10 ng/ml; Endogen) and IL-10 (10 ng/ml; Endogen) were added after the first stimulation only. Subsequent stimulations, 1 wk apart, were conducted using irradiated autologous monocytes pulsed with 20 μg/ml of peptide in 48-well plates at 2.5 × 104 cells/well. IL-2 was added 2 days after each stimulation at 50 U/ml (Chiron, Emeryville, CA). A total of three stimulation cycles were conducted before cloning. The cloning and expansion procedures were identical with that previously described 28 . T cells were plated at limiting dilution in 96-well round-bottomed plates in the presence of irradiated feeder cells (PBL and LCL) at a responder to stimulator ratio of 1:50,000 together with anti-CD3 mAb (OKT3, Ortho Tech, Raritan, NJ) and 50 U IL-2/ml (Chiron) in 0.2 ml of CTL medium. Wells positive for clonal growth were identified 10–14 days after plating and screened in a microcytotoxicity assay to identify those clones with cytolytic activity for peptide-pulsed target cells. Briefly, 100 μl from each well demonstrating clonal growth was tested against 2000 chromium-labeled unpulsed 221-A2 cells and 221-A2 cells pulsed with the relevant immunogenic peptide. 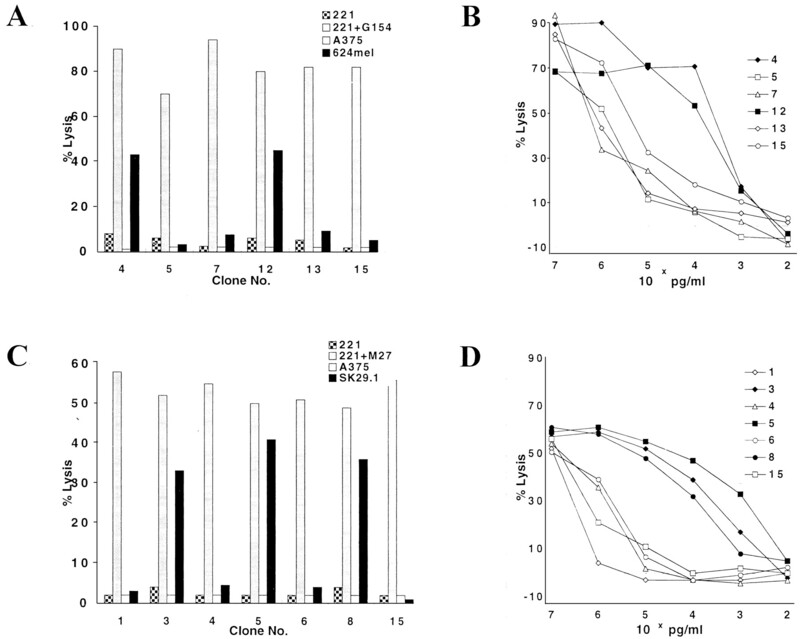 Peptide-specific clones were transferred to 25-cm2 flasks, restimulated with anti-CD3 mAb, and irradiated allogeneic PBL and LCL were added as feeder cells. The cultures were fed with IL-2 at 50 U/ml 48–96 h after restimulation. T cell clones were restimulated every 14 days. Following expansion, all clones were retested for peptide and tumor Ag-specific cytolytic activity, and cell surface phenotype (CD3, CD4, CD8, and CD16). Tetramers were made as described by Lee et al. (manuscript in preparation) according to the protocol of Altman et al. 10 . HLA-A2/peptide tetramers were produced as previously described 10 , except that folded material was subjected to enzymatic biotinylation before chromatographic purification. Briefly, human β2m and the soluble domain of the HLA-A2 heavy chain (residues 1–276) linked at its carboxyl terminus to a BirA substrate peptide 29 were expressed separately in Escherichia coli and isolated as insoluble aggregate. The expressed HLA-A2-BirA substrate peptide and β2m subunits were solubilized and refolded together in vitro in the presence of peptide. Folded material was then subjected to enzymatic biotinylation by BirA enzyme. HLA-A2/peptide complexes were purified first on a Superdex 200 (Pharmacia, Piscataway, NJ) gel filtration column and subsequently on a Mono Q (Pharmacia) ion exchange column. Tetrameric complexes of biotinylated HLA-A2/peptide were produced by mixing purified, biotinylated heterodimer with NeutrAvidin-phycoerythrin (Molecular Probes, Eugene, OR) at a molar ratio of 4:1. For each experiment the following control samples were used: unstained cells, control cells stained with tetramer-PE, control cells stained with anti-CD8-FITC, and control cells stained with anti-CD19-Cy5 (for compensation). Cells were also stained with anti-CD8-FITC, anti-CD19-Cy5, and avidin-PE to analyze background staining. Sample analysis was performed using 1–2 × 106 cells in 30 μl of 1% FCS/PBS. Anti-CD8-FITC (1/60), anti-CD19-Cy5 (1/90), and relevant tetramer-PE (final concentration of 20 μg MHC/ml) were added, and the staining was conducted for 4 h at 4 C. In samples not used for sterile sorting, 0.1% sodium azide was used, and staining was conducted for only 2 h. The cells were then analyzed on a Vantage Cell Corter (BDIS, Mountain View, CA) or a FACScan (BDIS) using CellQuest software (Becton Dickinson). Sorted cells were cloned and expanded using anti-CD3, IL-2, and irradiated feeder cells as described above. Peptides corresponding to the HLA-A2-restricted immunogenic epitopes of gp100 (G154: KTWGQYWQV) and MART-1 (M27:AAGIGILTV) were used to generate CTL clones from eight HLA-A2+ donors according to the protocol described above. Studies from two representative donors, UPN 7021 and UPN 6163, are described. Of approximately 400 clones screened against peptide-pulsed and unpulsed HLA-A2-matched targets in a microcytotoxicity chromium release assay, four to eight peptide-specific CTL clones were subsequently isolated that proved to be tumor reactive. The low percentage of tumor-reactive CTL clones (1–2%) found among the peptide-specific CTL isolated from patients 7021 and 6163 is representative of that observed in the six other HLA-A2+ donors (data not shown). Clones considered to be peptide specific following screening in microcytotoxicity assays were expanded and tested for their ability to lyse the following targets: unpulsed 221-A2; peptide-pulsed 221-A2; Ag-positive, HLA-A2-positive tumor cells (624 mel or SK29.1); and Ag-negative, HLA-A2-positive tumor cells (A375). Representative gp100- and MART-1-specific clones from each patient are shown (Fig. 1⇓). CTL demonstrating specific lysis of peptide-pulsed targets and not Ag-positive tumors (G154-specific clones 5, 7, 13, and 15 (Fig. 1⇓A) and M27-specific clones 1, 4, 6, 15 (Fig. 1⇓C)) have been defined as peptide-specific, whereas the clones demonstrating specific lysis of peptide-pulsed targets as well as Ag-positive tumors (G154-specific clones 4 and 12 (Fig. 1⇓A) and M27-specific clones 3, 5, and 8 (Fig. 1⇓C)) have been defined as tumor-reactive. To further characterize the avidity of these CTL clones for their target Ag, we tested for lysis of HLA-A2+ targets pulsed with decreasing concentrations of peptide ranging from 107 to 102 pg/ml (Fig. 1⇓, B and D). Two patterns of lysis were observed. T cell clones that lysed tumor targets (tumor-reactive CTL; e.g., G154-specific clone 4 (Fig. 1⇓A) or clone 3 (Fig. 1⇓C)) demonstrated specific lysis of A221-A2 cells pulsed with as little as 103 pg/ml of peptide, while peptide-specific nontumor-reactive T cell clones (e.g., clone 7 (Fig. 1⇓A) or clone 4 (Fig. 1⇓C)) only lysed targets pulsed with >105 pg/ml of peptide. Thus, higher concentrations of peptide could compensate for poor T cell tumor killing by increasing the avidity of the interaction. We wanted to determine whether the observed differential avidity of the T cells for the target cell reflected an inherent property of the TCR or was due to other factors such as the level of expression of accessory molecules or the TCR. Abs to CD8, LFA, and CD28 were used to stain representative peptide-specific and tumor-reactive CTL clones from patients 7021 and 6163. There was no detectable difference in the level of expression of accessory molecules among the different T cell clones. There was also no detectable difference in the level of TCR expression when staining was examined by flow cytometry using a pan-anti-TCR Ab (data not shown). High and low avidity peptide-specific CTL clones isolated from the peripheral blood of HLA-A2+ patients with melanoma. A, All representative CTL clones from patient UPN 6163 lyse 221-A2 targets pulsed with 10 μg/ml of G154 peptide but not unpulsed 221-A2. Clones 4 and 12 also exhibit reactivity to A2-matched Ag-positive (624 mel) but not Ag-negative (A375) tumor targets. B, CTL clones from UPN 6163 are tested against 221-A2 targets pulsed with decreasing concentrations of peptide from 107 to 102 pg/ml. Compared with other peptide-specific clones, tumor-reactive clones 4 and 12 exhibit high avidity for their targets and lyse 221-A2 cells pulsed with as little as 104 pg/ml of peptide. C, Three of seven representative M27 peptide-specific CTL clones from patient UPN 7021 lyse Ag-positive (SK29.1), but not Ag-negative (A375), tumor targets. D, High avidity CTL clones 3, 5, and 8 lyse 221-A2 targets pulsed with as little as 103 pg/ml of peptide. 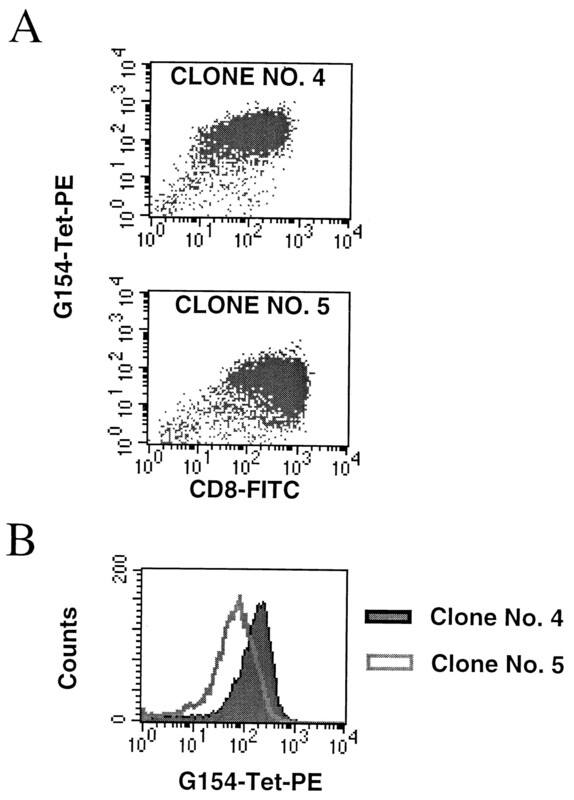 These results indicate that the TCR is predominantly responsible for the observed avidity of these CTL clones and suggest that the use of a reagent that depends solely on the affinity of the TCR for its peptide-MHC ligand might provide a means of isolating such T cells from a heterogeneous population. Peptides G154 and M27 were used in the construction of the peptide-MHC tetramers. The ability of these tetramers to specifically stain CTL through its cognate TCR was assessed by staining relevant and irrelevant peptide-specific CTL clones. The G154 tetramer, presenting the G154 peptide in the context of HLA-A2, specifically stained G154-specific CTL and not M27-specific CTL (Fig. 2⇓A). Conversely, the M27 tetramer, presenting M27 peptide in the context of HLA-A2, specifically stained M27-specific CTL and not G154-specific CTL (Fig. 2⇓B). To determine whether the tetramers can be used to recover peptide-specific CTL from a heterogeneous culture of bulk stimulated CTL, G154- and M27-specific tumor-reactive CTL clones (6163 Clone 4 and 7021 clone 5, respectively) were added to autologous PBMCs at frequencies of 1.0, 0.5, and 0.1% of the total PBMC population. The prevalence of peptide-specific T cells in an in vitro stimulated bulk culture after three cycles of in vitro stimulation ranged from 0.5–2% of the population. Using the specific peptide-MHC tetramers, the introduced CTL could be identified by flow cytometry and recovered following FACS sorting. To determine whether the recovered tetramer-staining CTL clones retained their functional phenotype following sterile sorting, the tetramer-positive population was expanded for further testing using anti-CD3 mAb, irradiated feeder cells, and IL-2. Similar to unmanipulated clone 4 and clone 5, the G154 and M27-specific CTL clones that were recovered specifically lysed peptide-pulsed 221-A2 cells and Ag-positive HLA-A2+ tumor cells (SK29.1 or 526 mel) but not unpulsed 221-A2 cells or Ag-negative HLA-A2+ tumor cells (A375) in a chromium release assay, demonstrating retention of their lytic phenotype following tetramer staining and recovery by cell sorting (data not shown). TCR-specific binding of peptide-MHC tetramers. 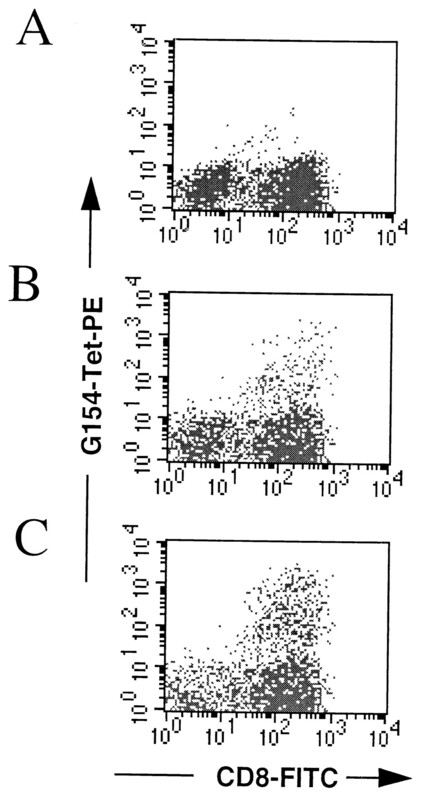 A, G154 peptide-MHC tetramer specifically stains the CD8+, G154-specific CTL clone but not a MART-1-specific CTL clone. B, The M27 peptide-MHC tetramer specifically stains the CD8+, M27-specific CTL clone but not a gp100-specific CTL clone. To determine whether peptide-MHC tetramers could discriminate high avidity tumor-reactive from low avidity peptide-specific CTL, we compared under identical staining conditions the tetramer staining of low avidity, peptide-specific CTL clones with that of high avidity, tumor-specific CTL clones isolated from the same patient. 6163 clone 5, a G154 peptide-specific CTL clone, and 6163 clone 4, a tumor-reactive CTL clone, were stained with PE-conjugated peptide-MHC tetramers and FITC-conjugated anti-CD8 Ab (Fig. 3⇓A). The mean fluorescence intensity of tetramer staining was approximately 0.5–1 log higher in the population of high avidity, tumor-reactive CTL (clone 4) compared with that of the low avidity, peptide-specific CTL (clone 5; Fig. 3⇓B). Staining of high and low avidity M27-specific CTL clones from patient 6163 and of both gp100 and M27-specific CTL clones from another HLA-A2+ patient, 7021, consistently demonstrated a higher mean fluorescent signal with the high avidity, tumor-reactive CTL clones than with their lower avidity peptide-specific clones (data not shown). Differential staining of high vs low avidity CTL clones by peptide-MHC tetramer. A, Tumor-reactive G154-specific CTL clone 4 from donor 6163 stains more intensely than the low avidity G154 peptide-specific CTL clone 5 using the PE-conjugated G154 peptide-MHC tetramer, as seen in a histogram plot (B) comparing the fluorescence of both CTL clones. To determine whether tetramer staining of a heterogeneous population of in vitro stimulated lymphocytes would allow visualization of CTL of defined specificity and provide sufficient discrimination between high and low avidity clones to permit selective recovery of tumor-reactive CTL, we analyzed PBL stimulated with autologous peptide-pulsed APCs after the first, second, and third cycles of in vitro stimulation using PE-conjugated peptide-MHC tetramers and FITC-conjugated anti-CD8 Ab (Fig. 4⇓). The CD8+, tetramer+ lymphocyte population began to appear after the first stimulation and became an increasingly visible proportion of CD8+ T cells after the third stimulation (Fig. 4⇓C). Unlike individual CTL clones that formed a tightly staining group of tetramer-positive cells, the tetramer+ T cells appearing in this heterogeneous population after the third stimulation showed a broad range of tetramer staining that could be arbitrarily divided between a tetramerlow and a tetramerhigh CD8+ population. Appearance of a G154 peptide-specific CTL population of cells with in vitro peptide stimulation. Cells are stained with G154-peptide MHC tetramer-PE reagent after the first (A), second (B), and third (C) cycles of in vitro stimulation using peptide-pulsed APCs (see Materials and Methods). The CD8-FITC+, tetramer-PE+ population of T cells increases from <1 to 8% of the culture population after three cycles of in vitro stimulation. To evaluate the functional phenotypes of these two populations of lymphocytes, cells from the tetramerhigh (group A) and tetramerlow (group B) region were sorted, cloned, and then expanded using anti-CD3, IL-2, and irradiated feeder cells for further analysis (Fig. 5⇓). The gp100-specific CTL clones sorted from group A from patient 7021 were tested for their ability to recognize peptide-pulsed targets and Ag-positive tumor cells in a chromium release assay (Fig. 5⇓A). A clone was considered tumor reactive if lysis of the Ag-positive target was >20%. Of these 20 peptide-specific, tetramerhigh CTL clones, 17 (85%) represented high avidity, tumor-reactive CTL. In contrast, only one of the 20 (5%) tetramerlow CTL clones isolated from group B were tumor reactive (Fig. 5⇓B). In patient 6163, cultures stimulated using the M27 peptide were stained with the M27 tetramer. Again, all clones isolated from both the tetramerhigh and tetramerlow groups were peptide specific. However, 80% (16 of 20) of tetramerhigh clones that were sorted, expanded, and tested against the Ag-positive targets were tumor reactive, while only 15% (3 of 20) of tetramerlow clones recognized Ag-positive tumor. Further analysis of the high and low avidity clones isolated from the tetramerhigh and tetramerlow groups, respectively, following sorting and in vitro expansion demonstrated no detectable differences in the levels of CD8, accessory molecule, or TCR expression between the two populations and the ability of tetramerhigh high avidity CTL to specifically lyse Ag-positive tumor and A2+ targets pulsed with as little as 103 pg/ml of peptide. Isolation of high avidity, tumor-reactive T cell clones from a heterogeneous population following sorting of tetramerhigh CD8+ T cells. Following in vitro stimulation with peptide-pulsed APCs, the culture population was stained with FITC-conjugated anti-CD8 Ab and the PE-labeled G154-peptide-MHC tetramer. A, CD8+ G154-tetramerhigh T cells (group A) were sorted and cloned. Following in vitro expansion, 20 clones (A1–A20) were tested against peptide-pulsed and Ag-positive tumor targets. B, CD8+, tetramerlow T cells (group B) were sorted, cloned, and tested in a similar manner against peptide-pulsed and Ag-positive tumor targets. A significantly greater frequency of tumor-reactive CTL clones was isolated from the tetramerhigh group A population of T cells (17 tumor-reactive clones of 20 clones tested) compared with T cells isolated from the tetramerlow group B population (1 of 20 clones). To demonstrate that the tetramerhigh and tetramerlow staining of high and low avidity CTL clones represented a stable phenotype, the recovered CTL clones, following in vitro expansion, were reanalyzed (Fig. 6⇓). Representative tumor-reactive high avidity CTL clones sorted and cloned from group A retained their tetramerhigh phenotype, while nontumor-reactive, peptide-specific CTL continued to express a tetramerlow phenotype consistent with low avidity CTL. Repeat staining also demonstrated no detectable differences in the levels of CD8, accessory molecule, or TCR expression between the two populations. With subsequent re-expansion, only the high avidity CTL clones isolated from the tetramerhigh population lysed Ag-positive tumor and A2+ targets pulsed with as little as 103 pg/ml of peptide, demonstrating the persistence of a stable functional phenotype (data not shown). Staining of tetramerhigh tumor-reactive T cell clones from heterogeneous population of CD8+ T cells following in vitro expansion. 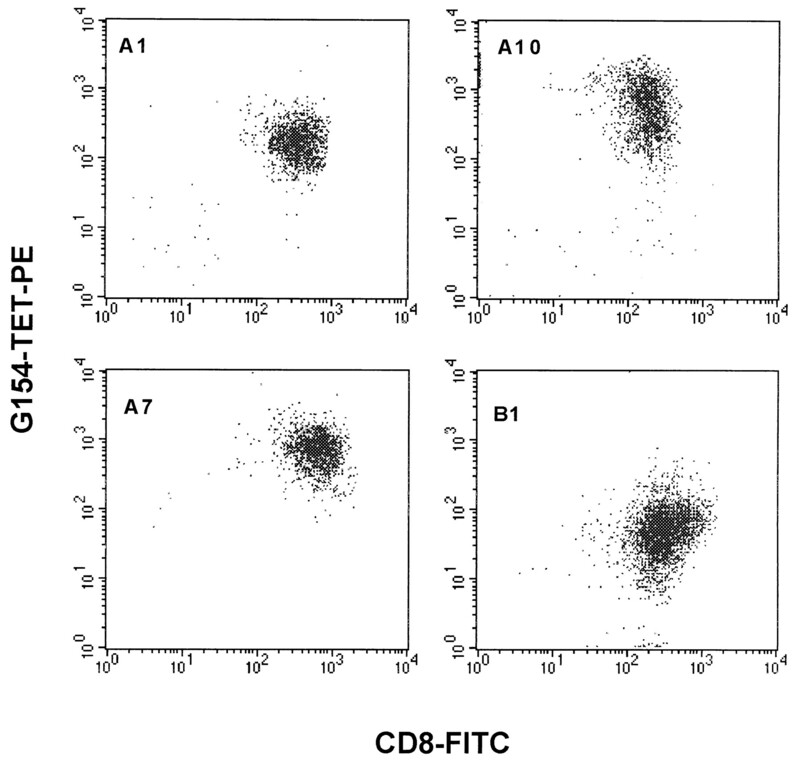 Following in vitro expansion, CD8+ tetramerhigh T cell clones were stained with FITC-conjugated anti-CD8 Ab and the PE-labeled G154-peptide-MHC tetramer. Four representative CTL clones are shown: three tumor-reactive CTL clones (A1, A7, and A10) from group A (Fig. 5⇑) and one peptide-specific, nontumor-reactive CTL clone (B1). Tetramer staining demonstrates that the tumor-reactive CTL clones retain their tetramerhigh phenotype following in vitro expansion, while the peptide-specific, nontumor-reactive CTL clone (B1) demonstrates tetramerlow staining consistent with a low avidity phenotype. A requirement for achieving effective adoptive therapy is the ability to generate high avidity tumor-reactive T cells from the peripheral blood of patients. The general strategy of using peptide-pulsed APCs to generate tumor Ag-specific CTL preferentially enriches a population of low affinity peptide-specific CTL clones that do not recognize tumor endogenously expressing Ag 9 . The isolation of the rare high avidity effector cells from this population of peptide-reactive cells often requires extensive cell culturing and cloning that can become logistically prohibitive for the timely treatment of patients with progressive malignancies. In this study we demonstrate that peptide-MHC tetramers can be used to rapidly and efficiently isolate high avidity Ag-specific T cell clones from the peripheral blood of patients with melanoma, that the avidity for tumor targets of T cells cultured under identical conditions seems largely due to the affinity of the TCR for its peptide-MHC ligand, and that this correlates with the intensity of staining by the specific peptide-MHC tetramer by flow cytometry. These results are consistent with recent data in which the level of binding of multivalent soluble class II MHC covalent peptide complexes was shown to be directly proportional to the affinity of the TCR for the peptide-MHC class II complex and that CD4 did not contribute to the overall binding avidity 30 . Our results also demonstrate that tetramerhigh clones, when sorted and expanded from an in vitro stimulated population of T cells, yielded a frequency of high avidity tumor-reactive CTL clones (80–85% of all clones) 4- to 5-fold greater than that isolated from a tetramerlow population of clones (5–19%) and a frequency at least 50-fold higher than that isolated from an unselected population of in vitro stimulated T cells (1–2%). These high avidity CTL clones displayed a stable tetramerhigh phenotype, reactivity to Ag-positive tumor, and low peptide dose requirement for target lysis (<104 pg/ml). The very high frequency of CTL clones isolated from bulk cultures using this method should enable the routine isolation of tumor-reactive effectors for adoptive therapy after only two or three cycles of in vitro stimulation, thereby decreasing the time to CTL generation by 50% and the required resources involved in cloning and screening hundreds of clones by severalfold. Alternative approaches that have been explored to manipulate culture conditions to favor the generation of high avidity CTL include the use of suboptimal concentrations of peptide for in vitro stimulation 8 . Under such conditions, it is believed that only high avidity CTL will be restimulated by the low Ag density present and will persist in culture. As in our findings, these authors also demonstrated that T cell avidity did not correlate with the levels of expression of accessory molecules on the T cell but was possibly related to TCR affinity for its peptide MHC ligand 8 . However, in their experimental model, effector cells were isolated from splenocytes of mice immunized with recombinant viral Ag from which a very high precursor frequency of effector CTL could be expected. It is not known whether such an approach would be equally effective in the isolation of tumor-reactive CTL from the peripheral blood of patients with malignancies. Other strategies include the use of specific Abs to the TCR Vα or Vβ regions expressed by T cell clones known to be tumor reactive 31, 32 . In one study the majority of MelanA/MART-1-specific CTL clones isolated from patients with melanoma was found to express a very limited Vβ repertoire, suggesting the possibility of using anti-TCR Abs to select or preferentially expand these T cells 33 . However, our unpublished data and the results of other studies 34 demonstrate that even when the identical immunogenic peptide was used, the CTL clones generated from individual patients were biased toward the expression of different TCR Vβ genes. Therefore, a priori knowledge of the TCR Vβ or Vα phenotype of useful tumor-reactive clones for each patient treated would be required. In addition, Abs to all the Vβ or Vα genes do not exist, thus excluding this approach for patients for whom the TCR Vβ or Vα of tumor-reactive clones cannot be identified, thereby limiting the broad application of this approach. An additional advantage with the use of peptide-MHC tetramers is that the construction of novel tetramer reagents can be easily generated to stain T cells of other specificities. Once peptides corresponding to immunogenic epitopes of target Ags have been identified, only a relatively small quantity of purified peptide (10 mg) is required for the assembly of novel tetramers. The mechanism responsible for increased intensity of TCR staining with the peptide-MHC tetramer when comparing high vs low avidity clones bears further examination. It does not appear to be related to the level of CD8 or accessory molecule expression, although systematic Ab blocking experiments would need to be conducted to more fully evaluate this possibility. Additionally, this difference in staining intensity does not appear to be related to the density of TCR expression, since flow cytometric analysis using anti-pan TCR Ab revealed no difference in staining between high vs low avidity T cells. The variation in staining intensity may reflect the following possibilities: 1) a difference in TCR density exists that is not detectable by anti-TCR Abs but is detectable by peptide-MHC tetramers, or 2) the dissociation rate for TCR-peptide/MHC interaction may be sufficiently rapid for low affinity clones so that a lower proportion of tetramer-bound TCRs at a given time will result in lower fluorescent intensity. A more rigorous examination of TCR affinity through the use, for example, of standard receptor-ligand binding assays would be required to confirm this hypothesis. Nevertheless, peptide MHC tetramers staining a heterogeneous population of T cells does allow for visualization in real-time of T cells of defined specificity and, as demonstrated in this study, their avidity phenotype. This can be used to evaluate the result of manipulating culture conditions to enhance the outgrowth of high affinity, tumor-specific populations under the influence, for example, of immunomodulatory cytokines such as IL-7 or IL-10 2, 35 . However, the application of this approach becomes especially advantageous compared with currently available methods when examining in vivo phenomenon. For example, a limiting dilution analysis (LDA), which consumes more cells and requires more time than a flow cytometric analysis using peptide-MHC tetramers, differs from direct detection assays because it requires cell division before measurable killing can be detected. As a result, LDAs provide an estimation of only clonable CTL and not the larger population of effector CTLs that are present in vivo that can be readily detected by tetramer staining 13 . Additionally, LDAs cannot provide an accurate representation of the actual in vivo proportion of high vs low avidity CTL, since subtle differences in restimulation conditions can alter LDA results. Enzyme-linked immunospot assays and PCR-based tracking of specific TCRs are a more direct estimate of in vivo CTL frequency than LDAs. Although more sensitive than tetramer analysis, these assays cannot provide information regarding the avidity phenotype of individual CTL 36, 37, 38 . With peptide-MHC tetramers, T cells can be directly stained and analyzed with respect to their specificity and avidity phenotype without further in vitro manipulation. In addition, tetramer-bound T cells can be recovered for further in vitro culture and analysis. Insights into how the T cell repertoire develops and autoimmunity is prevented may be acquired without the use of transgenic animals, since tetramers can readily assess differences in the affinities of specific TCRs for MHC ligands that positively select or delete developing thymocytes while, in the periphery, activate or delete the mature T cell 39, 40, 41 . Furthermore, in evaluating vaccination strategies, peptide-MHC tetramers can be used to expeditiously assess not only the number but also the avidity phenotype of potentially tumor-reactive T cells induced by various Ags or Ag delivery systems, and immunization strategies can be tailored to obtain optimal results 42 . More significantly, clinical studies using immunogenic peptides corresponding to tumor epitopes in melanoma have demonstrated the expansion of peptide-specific CTL in vivo without tumor response 4, 5, 43, 44, 45 . The use of LDA or an analysis of peptide-specific clones following in vitro cultivation fails to accurately estimate the in vivo population of tumor-reactive CTL because restimulation selects for the outgrowth and loss of specific T cell populations. Peptide-MHC tetramers, by virtue of the differential staining intensity of high vs low avidity CTL, can provide an estimation of these populations. Since peptide tetramers do not trigger the T cells at 4°C, clones can be isolated and subjected to further in vitro analysis. In this way, clinical trials of immunotherapy can be guided by the rapid assessment of the avidity phenotype of peptide-specific populations of CTL. Furthermore, direct isolation and expansion of T cell clones from these patients using peptide-MHC tetramers can provide a rapid means of generating tumor-reactive T cell clones for adoptive therapy. We thank Drs. Stan Riddell and Esteban Celis for helpful discussions and Karla Kenyon, Charles Torre, Sherri Kokx, and Maria Gonzalez-White for technical and administrative assistance. ↵1 This work was supported by National Cancer Institute Grant RO1-CA71849, a Burroughs Wellcome Fund Career Award (to C.Y. ), and a predoctoral fellowship from the Howard Hughes Medical Institute (to P.S.). Boon, T., P. Coulie, M. Marchand, P. Weynants, T. Wolfel, and V. Brichard. 1994. Genes coding for tumor rejection antigens: perspectives for specific immunotherapy. Important Adv. Oncol. 53.